The Coypu Foundation recently committed $26,000 to Ducks Unlimited to support mottled duck research in Louisiana. The western Gulf Coast population of mottled ducks have been declining over the past 40 years and biologists believe this is related to factors during the breeding season, such as nest site selection, nest success, re-nesting intensity and adult survival. 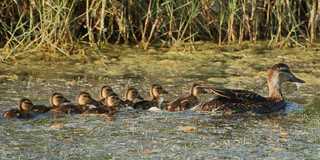 Due to the secretive nature of this species, there is a lack of understanding about mottled duck breeding ecology. Ducks Unlimited and partners, including Louisiana State University, the Louisiana Department of Wildlife and Fisheries, and the Gulf Coast Joint Venture, collaborated on a research study to better understand the breeding ecology of mottled ducks in southwestern Louisiana’s coastal marshes. This four-year study looks at the factors that impact nest success, adult survival during breeding season and breeding propensity (likelihood that the female will breed). The Coypu Foundation also provided funding during the first year. The study will provide important knowledge regarding mottled duck breeding ecology and will direct conservation and habitat management programs to sustain this species. 1) Assessing breeding habitat preferences of female mottled ducks as related to salinity regime, land management and environmental conditions such as drought. 2) Evaluating the influence of habitat characteristics at local- and landscape-level scales on nest success and, if possible, determining those factors influencing nest failure. 3) Estimating components of mottled duck breeding ecology, such as nesting propensity and re-nesting intensity as related to landscape characteristics and environmental variation. 4) Quantifying adult mottled duck survival during the breeding season. The study is in its third year of data collection. Once completed, the data collected will be overlaid on coastal marsh habitat maps provided by the US Geological Survey, the Gulf Coast Joint Venture and Louisiana State University to determine female nesting preference sites and ultimate success or failure at each nesting location. The results of the study will culminate with a doctoral dissertation and this information will be provided to Ducks Unlimited, the Louisiana Department of Wildlife and Fisheries waterfowl program and other Gulf Coast Joint Venture partners. The collaborators on this project will seek publication in several peer-reviewed journals.